Winter Trip to Zion National Park. Winter Vacation in Utah. 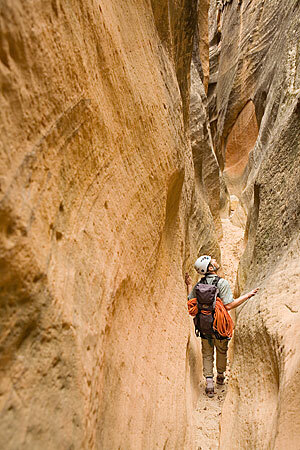 Winter can be a great time to visit Zion National Park. Hotel rates go down as well as park visitation. The Zion Canyon shuttle system is shut down(operating weekends only in Nov 2013) which means you can drive up Zion Canyon. It should be understood that weather can have a significant impact on your trip. The higher elevations will typically become inaccessible due to snow pack but many of the parks most popular trails will remain open. Zion Canyon(4000ft-4400ft) and the town of Springdale(3800ft) are lower-elevation areas and while it can snow on the valley floor it will melt off within a day or two. 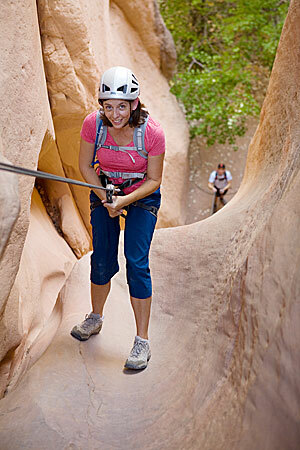 On lighter snow years the Angels Landing trail can be hiked all through the winter. On a heavy snow years the trail will be closed by the park service for months at a time. The north facing sections of the final ridge does not see any sun light and will hold snow and ice quite well. The trail features drop offs that need to be taken seriously especially in the winter time. Some outfitters rent crampons for winter hiking. 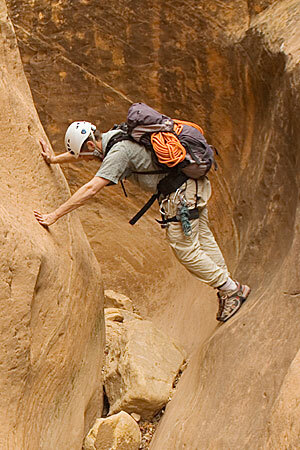 Hiking the Zion Narrows in the Winter is serious business. It is a very cold place! There is almost no sun exposure and you are hiking in a ice cold river. The north fork road closes every winter so hiking from the bottom is the only option. Drysuits, neoprene booties and other hypothermia preventing measure must be taken. The one advantage for going in the winter month is having the place to yourself as the narrows sees few visitors during the winter months. 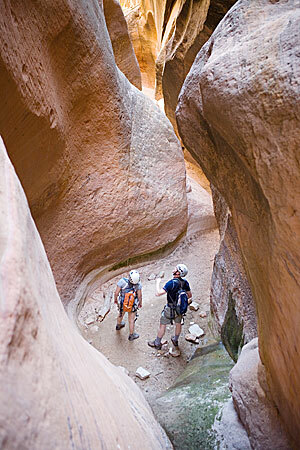 While some of the summer canyoneering areas become inaccessible during the winter months there are other winter areas that come into season. There are also some areas that fall in the middle and access will be dependant on the severity of the winter. 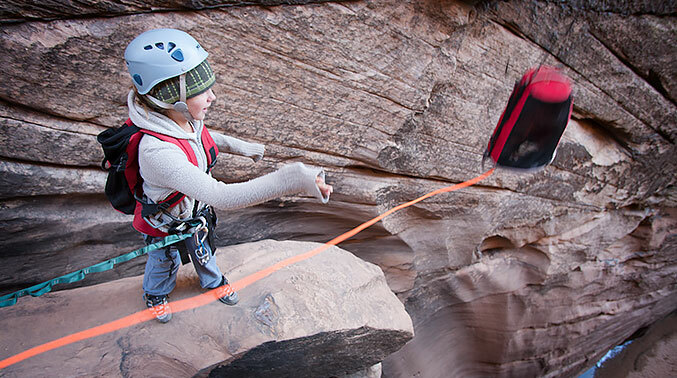 Typically it is more fun to stay dry during this season and a good guide service will provide a great winter canyoneering experience. A winter storm in Zion National Park can be a beautiful thing. It will be cold but scenic drives, short hikes, and photography can still be quite enjoyable. It’s a very good idea to bring lots of warm clothing and a hat. 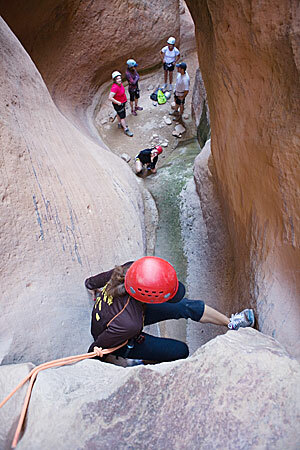 This entry was posted	on Saturday, November 23rd, 2013 at 5:14 pm	and is filed under Canyoneering. You can follow any responses to this entry through the RSS 2.0 feed. Responses are currently closed, but you can trackback from your own site.